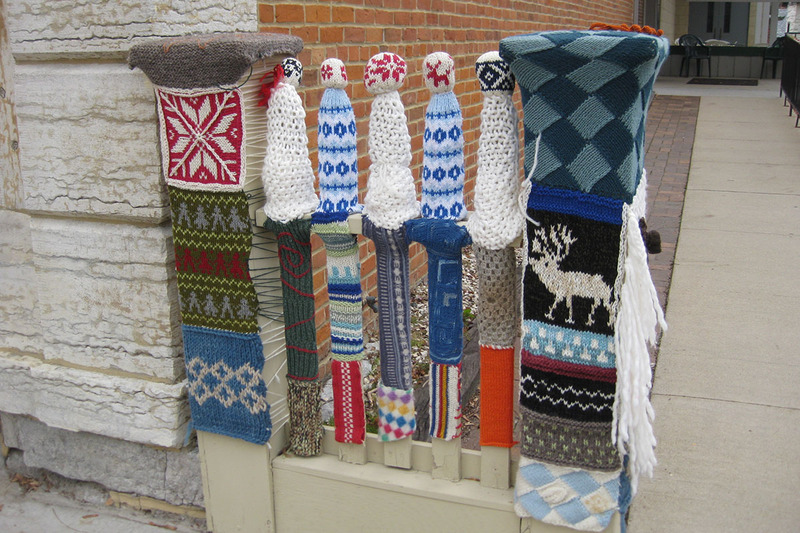 The yarn bombing outside the entrance to the main building of the Vesterheim Norwegian-American Museum in Decorah, Iowa, tells you that this building holds something very special for knitters and those interested in Norwegian history. 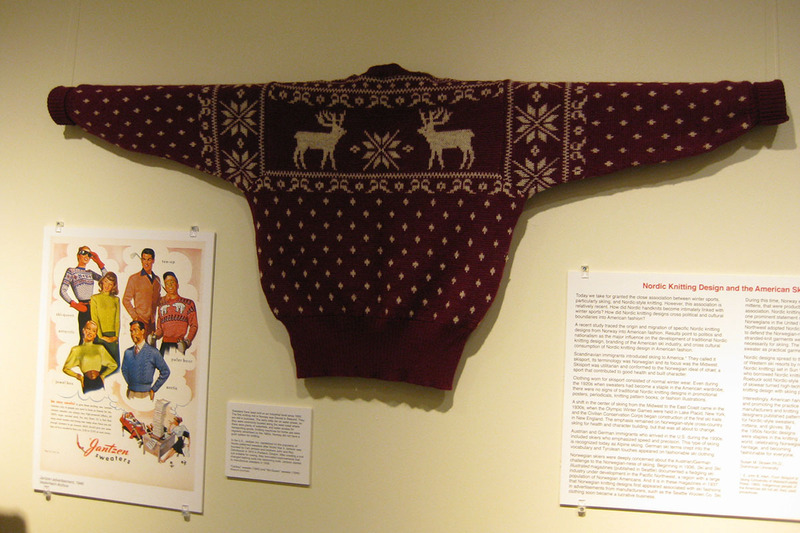 Now through April 24, 2016, Vesterheim offers a special exhibit titled “From Underwear to Everywhere: Norwegian Sweaters”. Two friends and I recently enjoyed a tour of the exhibit with Chief Curator Laurann Gilbertson and I’m going to tell you all about it. But if you’re anywhere nearby or can get there, I certainly recommend that you visit the museum to see the exhibit in person. Learn more about the exhibit and Vesterheim at their website: www.vesterheim.org. Vesterheim has over 24,000 artifacts, 12 historic buildings, a Folk Art School, and a library and archives. They feature the most extensive collection of Norwegian-American artifacts in the world. Decorah is a charming and well-preserved town in northeastern Iowa that offers many restaurants and shops to explore. We began our tour with the oldest sweater in the Vesterheim’s collection. 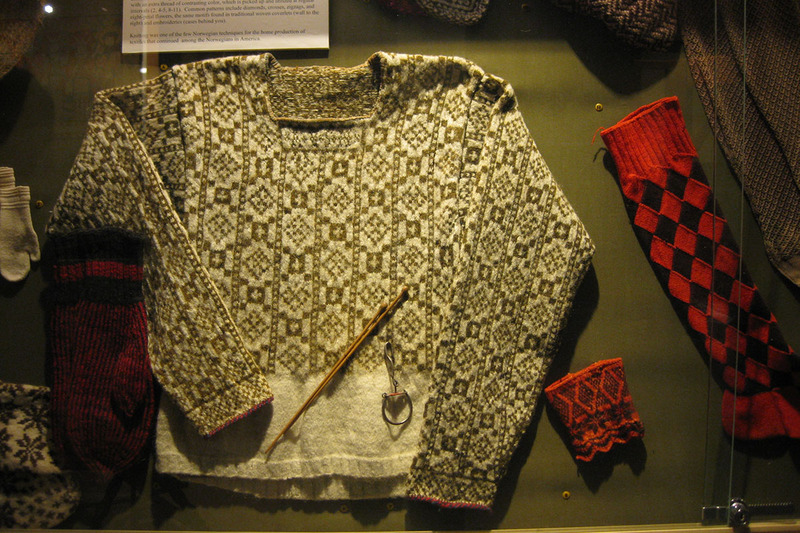 Dating back to the mid-19th century, it illustrates how the sweaters were created with a white space on the bottom that was meant not only to save yarn and knitting time by not having to knit the pattern where it would be hidden under clothing but also to protect the wearer from evil spirits (white was considered a protective color). The X’s and O’s pattern at the bottom, neck and sleeves were also protective. The squared neck tells us that this sweater was meant to be worn as a middle layer under a collared shirt. The two-colored patterning was considered more appropriate for clothing that might be visible. The checkerboard pattern around the bottom of this sweater was supposed to keep out nightmares. 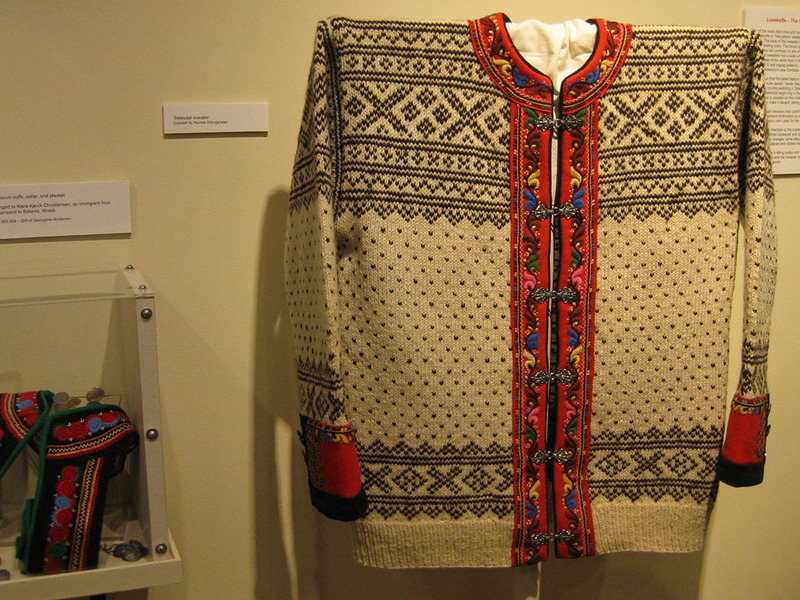 Eventually, the sweaters became popular as outerwear and distinctive styles were developed for different regions, often based on bunads (native costumes) or other textiles from the area. Setesdal was the first to develop a distinct sweater style with the X’s and O’s pattern on the openings at the sleeves and the bottom of the sweater and in the yoke, and the “lice” or single contrasting stiches throughout the body. The first sweater is typical of Setesdal, while the second sweater shows the style of the Valdres region with its floral embroidery trim. 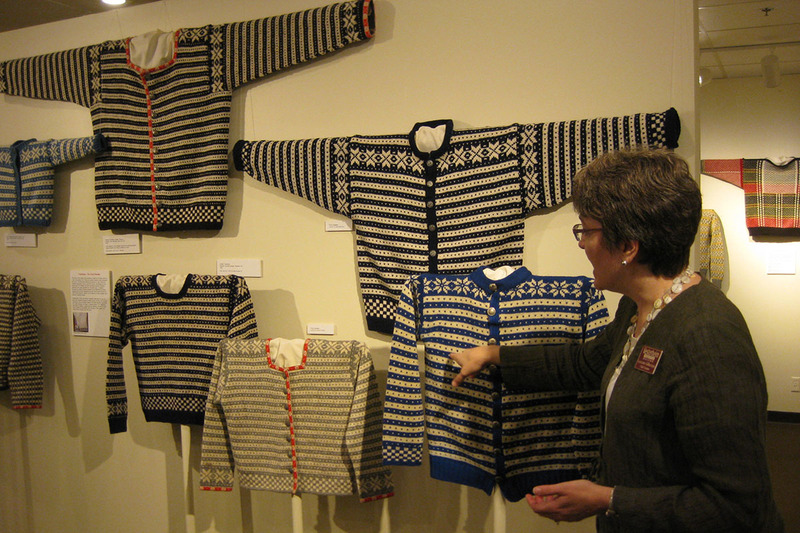 Laurann Gilbertson pointing out design features of typical Norwegian sweaters. 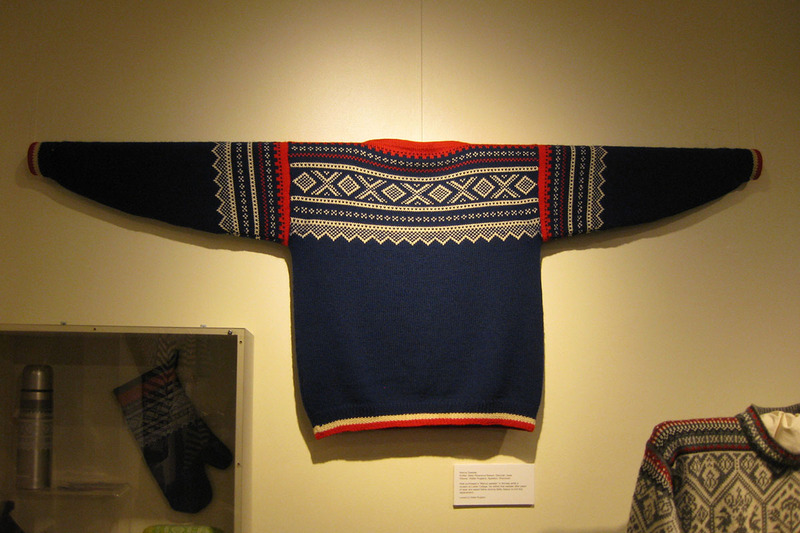 The Olympics popularized Norwegian sweaters when the Dale of Norway company began making sweaters for the Norwegian National Ski Teams in 1956. They create a new sweater for every new Olympic season. 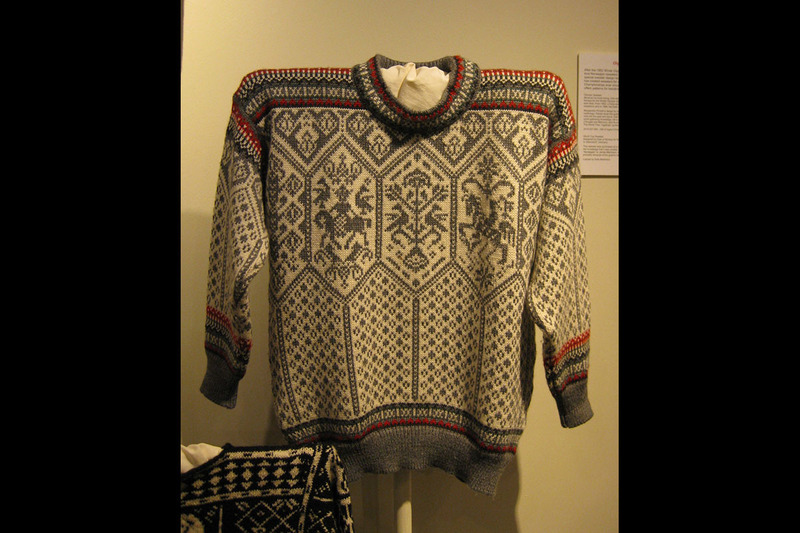 When Norway hosted the 1994 Winter Olympics in Lillehammer, Dale created the lovely sweater pattern shown in the first photo. 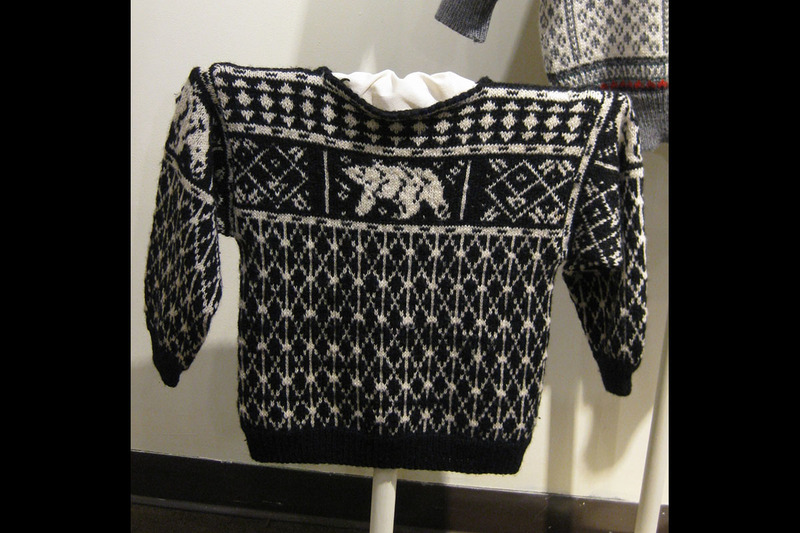 The 1987 sweater shown in the second photo is a child’s version. 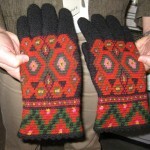 One of the most popular patterns throughout the years is the Marius, named for Norwegian slalom skier Marius Eriksen, shown in the third photo. Today this trendy pattern shows up on many items, from cell phone cases to towels. American companies such as Jantzen got in on the trend with sweaters such as this one. 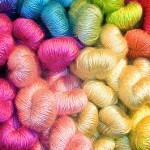 One of the variations to traditional patterns is a rounded yoke. 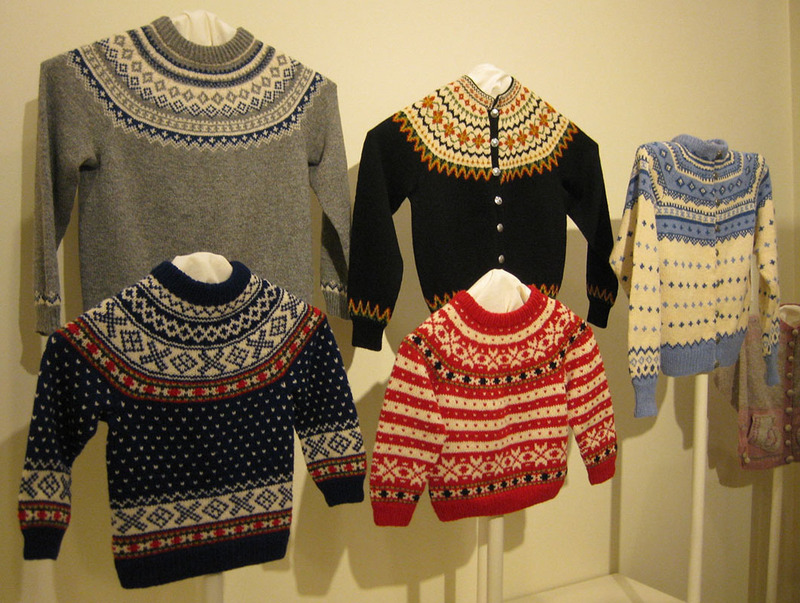 Children’s sweaters were often made by grandmothers in Norway and sent to the U.S. Correct sizing was sometimes obtained by having the child lie on a large piece of paper and tracing an outline. 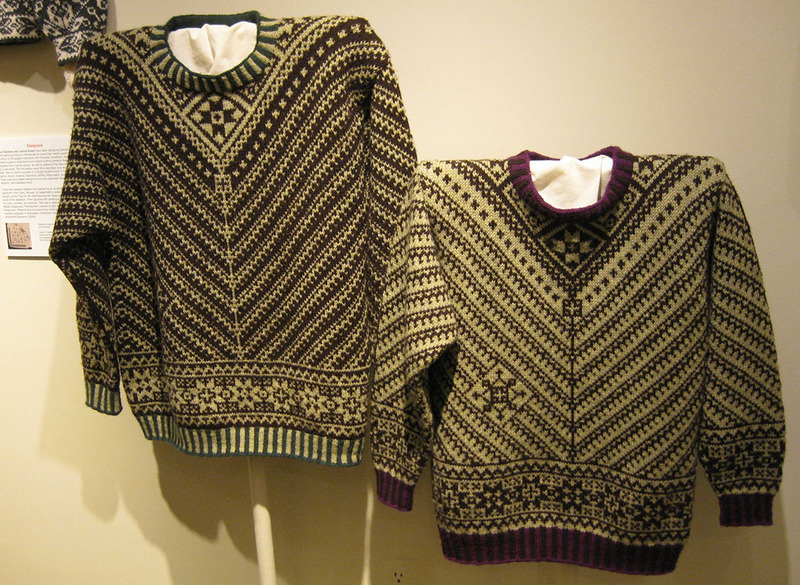 Traditional Norwegian patterns found in textiles and other designs are being adapted in sweater patterns such as these two mirror image sweaters. 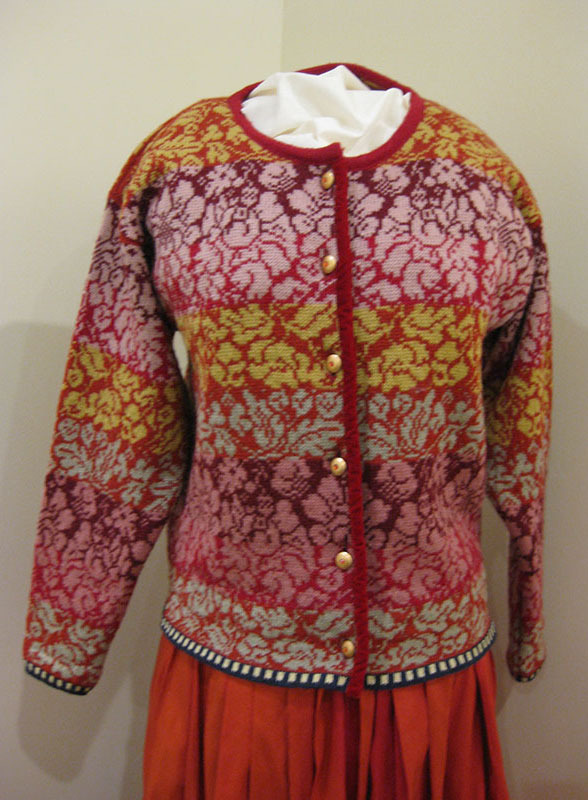 The Norwegian company Oleana takes inspiration from fabrics found in the Norwegian native costume culture and created this sweater from a textile piece held in Vesterheim’s collection. 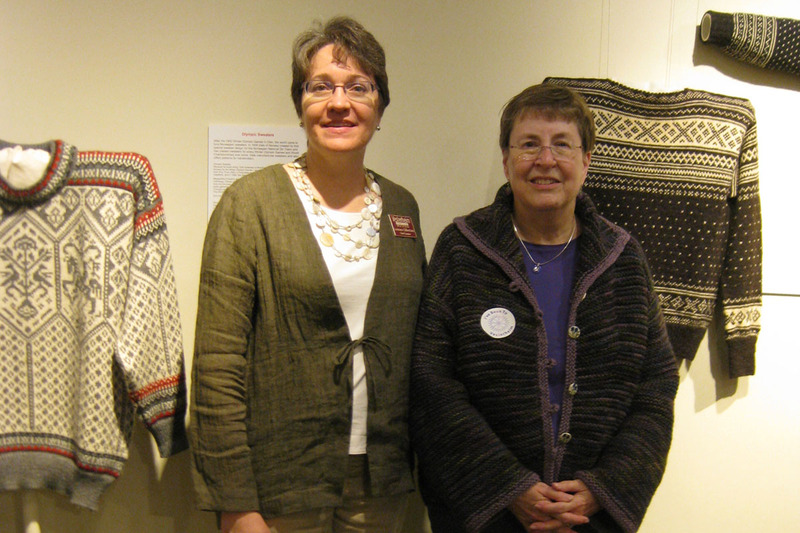 Mange takk (many thanks) to Laurann Gilbertson (on the left) for taking the time to share the wonders of this exhibit with us!